After the long holiday weekend, most people are either reenergized or flat-out tired. I ended up in the flat-out tired column and that’s why I needed a simple dish for dinner that was filling and super easy to make. You all know I love cooking with my cast iron skillet. Another filling and flavorful dish you should try is my Creamy Skillet Swiss Chard and Chickpeas with Crunchy Breadcrumbs. It’s a great vegetarian dish that is nothing but pure comfort. I love that cooking this shrimp in a cast iron skillet gives it a nice lightly crusted texture along with great flavor. 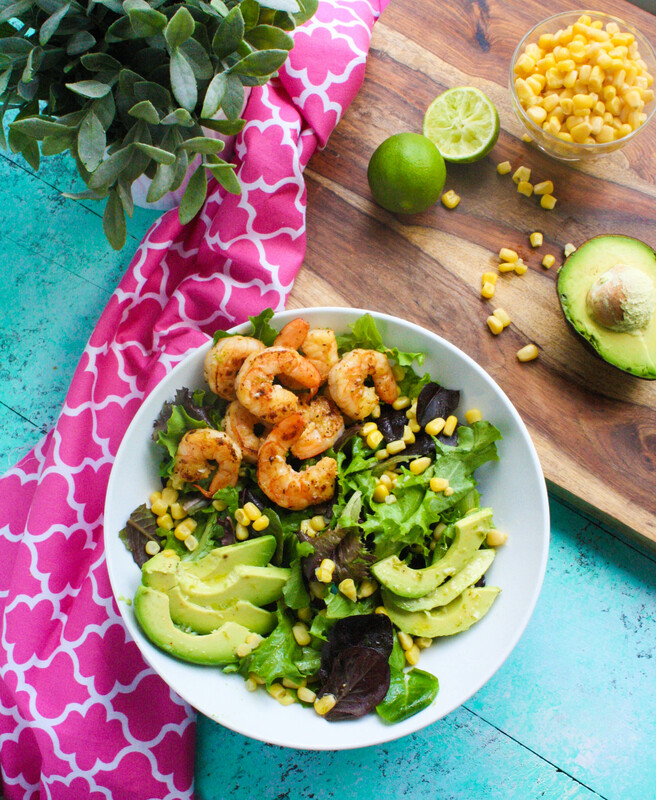 That’s what you’ll get outta this Simple Skillet Shrimp Salad with Lime Vinaigrette. Thank goodness for simple salad dishes that are lighter, but still filling. The seasoned shrimp added a tasty touch of protein to keep me full and to help re-energize me! Over the weekend I picked up some fabulous seasoning at Penzeys: Arizona Dreaming seasoning. This seasoning is salt-free and includes ancho chili pepper, black pepper, onion, garlic, paprika, spices, cumin, citric acid, Mexican oregano, cilantro, lemon peel, chipotle pepper, red pepper, jalapeño, cocoa, and natural smoke flavoring. I love the seasoning and I love Penzeys. The company gave away this seasoning as one of its many promotions, this one in honor of the late Senator John McCain of Arizona. When I say this shrimp dish is so simple and easy to put together, I mean it! Especially when you have a great seasoning on hand for the shrimp. If not, you can easily make your own by tossing together some of your favorite spices. The lime vinaigrette can be made in about two minutes, and you might even be able to make it with your eyes closed (but please don’t). 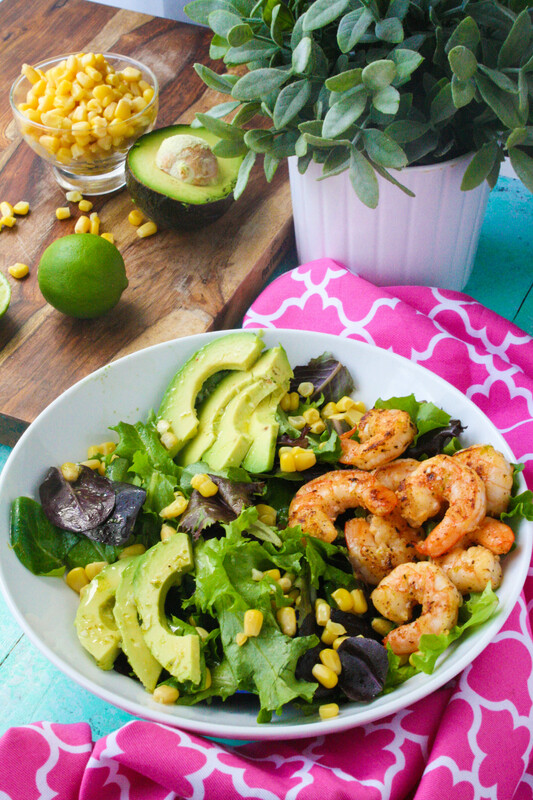 The lime goes really well with the shrimp and avocado. If you’re into skillet dishes like I am and you love shrimp, too, try my Shrimp Veracruz recipe. It’s another simple, hearty meal you can get together quickly. I don’t keep my skillet dishes to main dishes, only! Check out my Strawberry-Rhubarb Crumble for Two. That fresh fruit is so tasty! 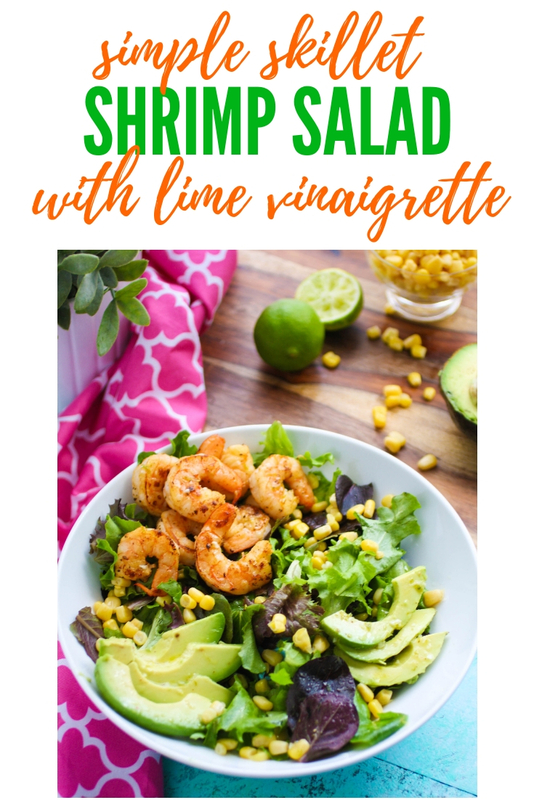 Whatever column you find yourself in after a long holiday weekend, you should give this Simple Skillet Shrimp Salad with Lime Vinaigrette a try. It’s perfect while the weather is still warm, and it makes a great main dish on a busy night. Add the shrimp and the 2 ounces lime juice to a bowl. Add the seasoning mix and toss to combine. Add the skillet to medium-high heat and when hot, add the oil. Cook the shrimp for about 2 minutes on each side. Remove from the skillet and set aside. Add the salad greens and corn to a serving bowl. Combine the lime juice, zest, and olive oil into a bowl and whisk to combine. Use the back of a knife to flatten and mash the garlic with a bit of salt until it turns into a paste. Add this to the bowl with the lime juice and oil, along with salt and pepper. Drizzle the dressing over the salad greens and corn and toss to combine. Add the avocado slices and the shrimp and drizzle some of the dressing over each. Love the looks of this salad. Going to try it soon. 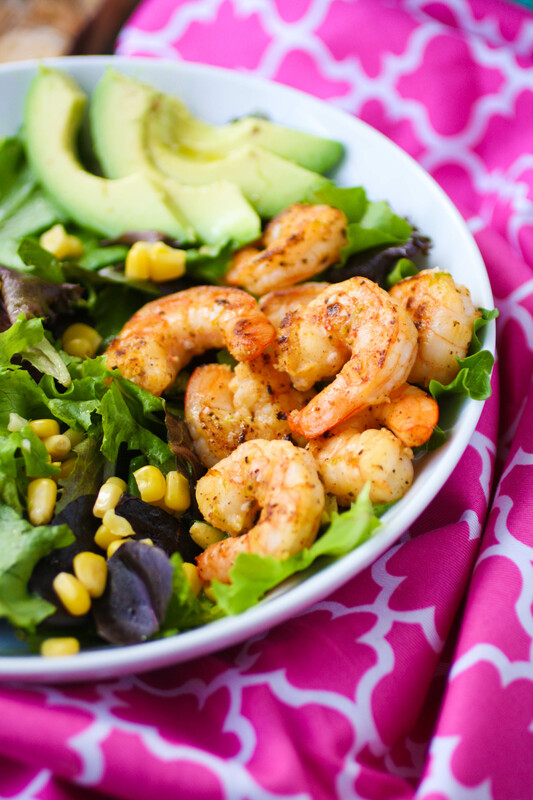 I love the way this salad looks, I'm such a fan of shrimps! Yum!! That sounds so good!! I need to try this! Thanks for sharing! This dish looks so flavorful and fresh! And that dressing sounds delish! I love making and eating these types of fresh salads. 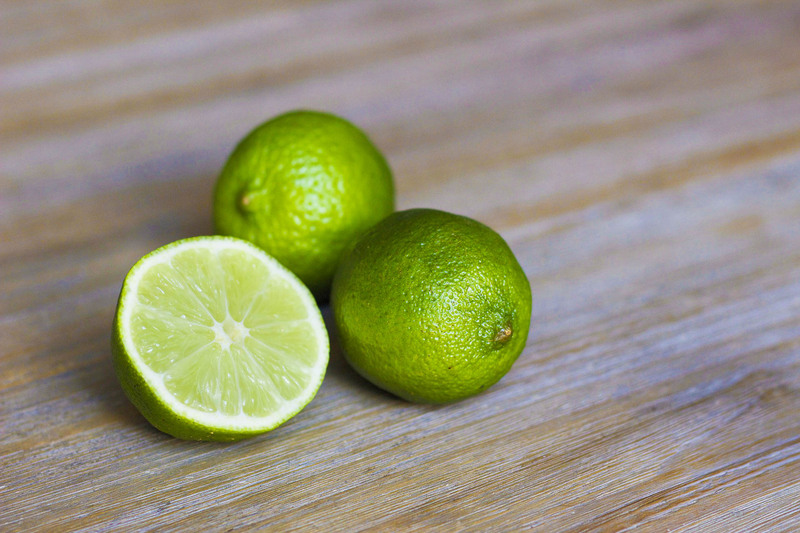 Using the lime juice makes everything pop and taste fresher. this looks so great! And i have all of it in my fridge, looks like I know what Im making for dinner! yum! And thnaks! Yum! I've been in a salad mood here lately and that vinaigrette sounds scrumptious! OMG this looks so delicious! I can't wait to make this for my family!! Thanks for sharing!! Yum! I love tossing shrimp in hot sauce to cook and then put on salad. What a treat. This salad look so tasty. Shrimp and Avacodos are my faves. Wow! This looks delicious and so easy - which is a MUST for me! It has all my favorite flavors in one simple dish. That's a winner!! That looks so delicious! 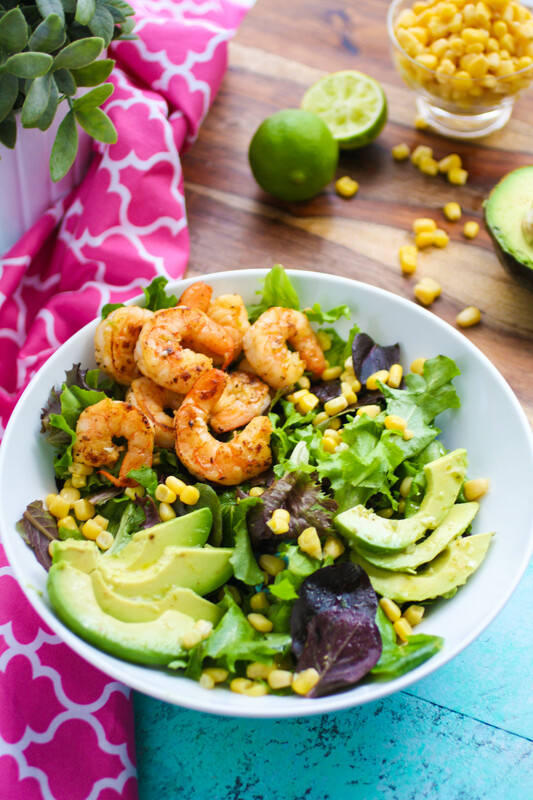 Love the addition of the avocado with the shrimp! This looks amazingly fresh and simple. Skillet meals are my fave. I need to add more green into my diet so this looks like a great salad to add to my meal planning.